Yory Boy Campas has been to places inside himself that most people would never risk venturing. Despite 101 wins and 79 knockouts, he is still hungry and tenacious after decades in the fight game. At age 42, Campas (101-17-3) is a Mexican fighting legend. He has faced several critical moments of truth. He doesn’t plan to linger in our midst in a lesser form. He will be back at work on April 5 in Montana, on the road to perhaps another marquee shot. Born in Sonora, Mexico, Luis Ramon Campas stacked up a 37-0 record (34 knockouts) before his 21st birthday. Only after he had approximately 50 bouts did he begin boxing in the United States, in the early 1990s. A longtime favorite at the former Grand Olympic Auditorium in Los Angeles, Campas is an eternal soldier, tearing into his opponents with strong shoulders and thrashing body blows. He likes to finish the opposition – and that’s always been part of his appeal. Campas still elicits cheers and songs among his contingent of Mexican and Mexican-American fans. South of the border, his name reverberates. If you were to introduce him in the center of the ring, in, say, Sonora, or, somewhere in California, the audience would roar with delight. And that is for good reason. 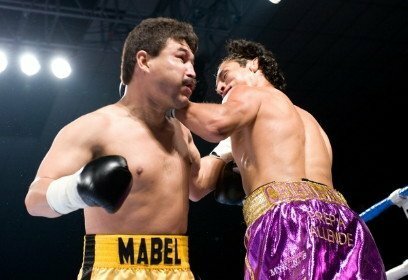 On December 6, 1997, in Atlantic City, New Jersey, Campas became world champion by dismantling the previously unbeaten Raul Marquez (28-0 at the time) on an eighth-round TKO. Campas walked into the Atlantic City Convention Hall as a 7-5 underdog. In a display typical of Campas’ consummate hardiness, he upset Marquez to win the International Boxing Federation’s (IBF) junior middleweight crown. At the age of 26, after 70 total professional fights and two failed title shots, Campas won his first championship at the 2:29 mark when the fight was stopped with Marquez barely able to defend himself. Campas’ relentless assault left Marquez unable to see out of his right eye. Campas defended his title three times, beating Anthony Stephens, Pedro Ortega, and Larry Barnes. On December 12, 1998, Campas was stopped in the seventh round against Fernando Vargas. On May 3, 2003, he tried to capture the WBC and WBA light middleweight titles against Oscar de la Hoya, but lost by knockout in round seven. His September 2006 war at Madison Square Garden with Ireland’s John Duddy was ‘Fight of the Year’ material. Campas lost a unanimous decision in one of the most vicious and action-packed fights in recent years. On March 30, 2012, Campas chalked up his 100th career victory via a second-round knockout of Mauro Lucero. On April 5 at the Silver Spur Arena and Event Center in Belgrade, Campas is slated for an 8 round bout with a hardnosed Ukrainian named Mikhail Lyubarsky. Born in Kiev, Ukraine, Lyubarsky fights out of Hollywood, California. He owns a 3-15 record and has not won a fight since 2006. Campas’ nickname, “Yory Boy,” or “White Boy,” derives from a Mexican indigenous word to describe light-skinned Indians who populate his region of northwest Mexico. He is humble and quiet, and he hopes that another title fight is on the horizon after he dispatches Lyubarsky. Campas says that recently he had the chance to mingle with the small Mexican population in Belgrade. Some boxers live careers that are so much of a sideshow that they should be traveling with a band of carnies instead of an entourage. Not Campas. Diaz says that Campas will offer the Montana crowd a speedy, efficient lesson in the fundamentals of boxing. Campas knows that in the fight game one punch separates boxing heaven from a tumble down to the bottom. He is preparing in earnest. Hollis Huggins says that he is proud to have Campas on his fight card and that the presence of the former world champion should inspire the undercard fighters. In other action, a six-round Montana junior middleweight title bout between Jesse Uhde and Daniel Gonzalez; a four-round match featuring former Montana lightweight champion Chris Asher against Eric Mafnas; Cotton Root battles Mario Riojas in a four-rounder. General admission tickets to the April 5 ‘Warriors World Class Fighters’ are $20 in advance; $30 at the door. For more info, call (406) 209-1386.